I never thought the day would come, but I’m currently on a facial lotion and cream kick. It’s been wonderful exploring the world of true water-based lotions and creams, especially when you’re an oil-and-balm girl like myself. So when it comes to a product hunt in a new territory, I know exactly where to begin: With a master line like Kahina Giving Beauty. 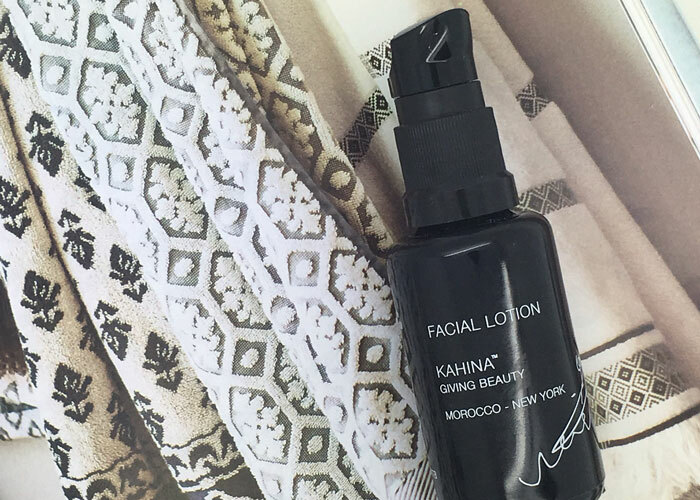 Kahina Giving Beauty’s Facial Lotion is a hidden gem in a collection dripping with exquisite oils and exotic scents. If you’re concerned about your skin’s hydration, consider adding a water-based cream or lotion into your routine — especially if you aren’t using a healthy amount of mist with your oils and balms. This is the only way your skin can get true hydration. This neutral-smelling facial lotion contains a short list of ingredients meant to hydrate, moisturize and soothe thanks to a blend of water, sodium hyaluronate, argan oil and shea butter. Concentrated beeswax adds a layer of protection to the skin without ever feeling heavy. Case in point: This facial lotion is housed in a luxe, hygienic pump jar, and you know a thick lotion would never have a chance being delivered that way! You’ll see in the ingredients list above that this facial lotion does contain the controversial Japanese honeysuckle extract, which acts as a preservative along with potassium sorbate in this water-based formula. You’ll have to make your own decisions when it comes to ingredients like this (see this post and this post and this post to go down the rabbit hole). But when it comes to product formulation and the chances for bacteria growth, yes, we need preservatives. It’s up to you to figure out your boundaries! Preservative system aside, I really like this lightweight facial lotion from Kahina. It has the perfect texture for layering. I can easily cleanse, tone and apply a dewy serum before massaging in this lotion. If I need more moisture, it’s simple to slide on a little facial oil to get that glow, and then go on with my makeup routine. That’s where your super-scented facial oils can come to play without interfering with any scents, because this is virtually scentless, or you can keep everything neutral by applying something like argan oil or prickly pear seed oil. 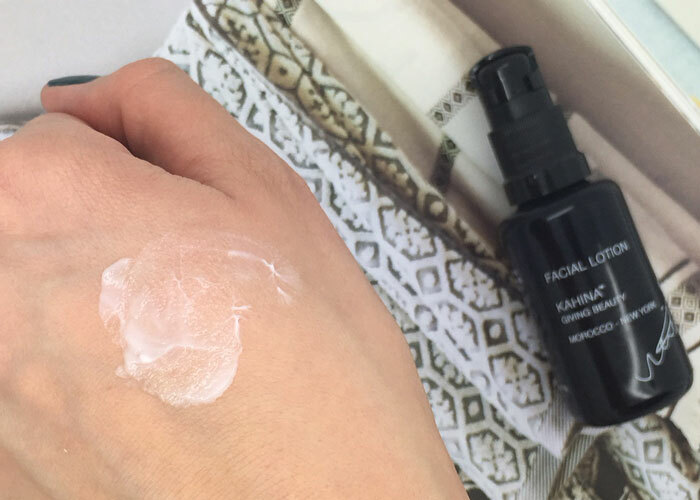 On the other hand, if your foundation is extremely glowy, you can skip the oils and treat Kahina Facial Lotion almost as a primer. My combination-oily skin was somewhat mattified when using it, thanks to its dry finish and non-greasy texture. I’m excited to continue my hunt for great lotions and creams, and I will definitely be restocking Kahina’s Facial Lotion. While I’m at it, I may grab a new jar of the popular Night Cream. Could this be the end of oils?! Are you experimenting with facial lotions and creams? What are your favorites? What do you think about the facial oil craze? Have you found your holy grail oils? Tell me everything in the comments section!